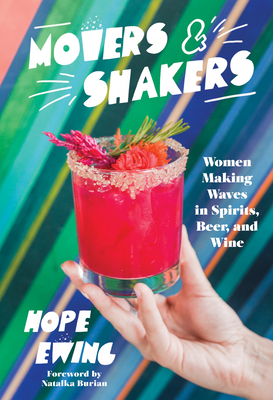 In her travels across the country, Hope Ewing discovers how women are paving the way and creating a more inclusive and sustainable world full of delicious drinks. A veteran bartender, Ewing had grown impatient with the surprisingly outdated perceptions of women in the alcohol industry. Entrepreneurial and ambitious, often the first in their fields, the women she knew in the business were leaders, mentors, and trailblazers. In Movers and Shakers, Ewing seeks them out, to share their stories as well as valuable business advice and insight into a constantly evolving industry. Hope Ewing grew up in a haunted house surrounded by forest and sheep pastures in western New York State. After a decade raising money for New York City arts organizations, she received an MFA in creative writing from Columbia University and promptly moved to Los Angeles, where she finally became serious about bartending. Combining the twin passions of writing and drinking, she seeks to illuminate how intoxication and culture intersect, for better and for worse. Her work appears in PUNCH, Serious Eats, and other fine publications. She lives in LA with her partner and step-chihuahua, and her favorite drink is all of them.